Editors Note – Apparently SDR Touch is temporarily off the Google Play Store. Martin hopes to have it back soon. You can still get SDR Touch directly from Martin, until the issue has been resolved. (See Martins comment below). In the meantime, you can download SDR Touch from Martin’s Website. Ok, this was bound to happen sooner later. With the introduction of some very powerful Android tablets last year in the $199 price range like the Nexus7, Kindle Fire, and the Samsung Galaxy Tab, combined with the availability of the inexpensive RTL2832U SDR dongles, it was inevitable that some would do a “mashup” of the two sooner or later. The result is an application called SDR Touch by Martin Marinov. At this time the application is still in the development phase, but is now available from the Martin’s Website. For that reason, any thing we say here may change in the next 5 minutes. We contacted Martin and he kindly sent us out the current fully functional version of SDR Touch to take a look at. We were impressed with Martins’ work. In a nutshell, SDR Touch allows you to plug in a RTL2832U stick via your Android devices’ USB port and SDR Touch allows you to tune and decode the audio from the RTL2832U stick. In essence, you can have a portable touch screen SDR radio for under $250. The other major factor to consider here is that SDR Touch proves that SDR can be implemented on a small battery powered processor. SDR Touch also opens the door for the possibility of the availability of the development of portable touch screen applications for other direct sampling SDR radios. 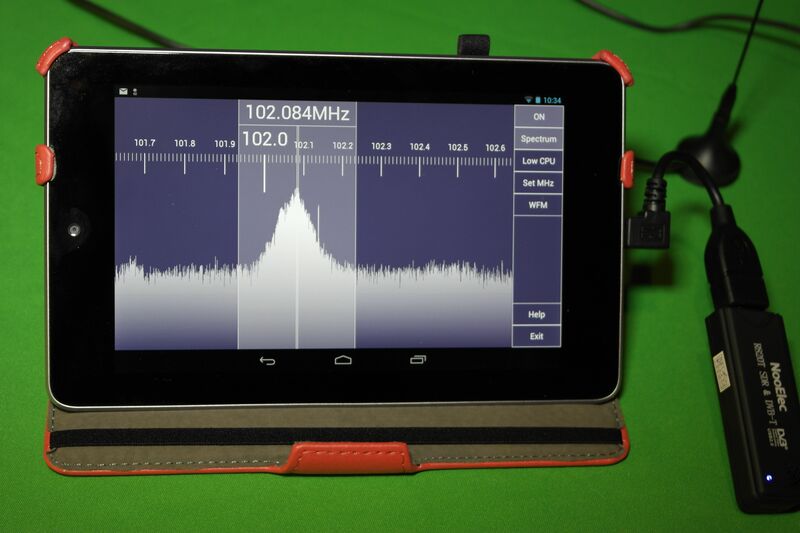 To use SDR Touch, you will need a fairly current Android device running at least Androd 4.0 (Ice Cream Sandwich) or higher. It is possible that SDR Touch may run under older versions of Android, but you will have to “root” your device to use it. Rooting your Android device is not recommended unless you really know what you are doing. You will also need an OTG (On The Go) USB adapter cable for your Android device to connect to the RTL2832U stick. Just any USB adapter won’t work since there is a slight wiring difference in the OTG cable. Of course you will need the SDR Touch application. It appears that Martin is going to make a demo version of SDR Touch available to allow you to test out the software on your device. To open up all the features it appears that you will need to buy a $9.99 key as an in app purchase. Having a demo version of the software is a good idea since there is such a variety in Android devices with different processors, form factors, etc. You should be able to test the software on your Android device to see if it is up to the task. Again, if you have a fairly current Android device with Android 4.0 or higher you should be good to go. In conclusion, SDR Touch is a great start towards providing a portable SDR solution with an Android device and a RTL2832U stick. This could be pretty useful for signal discovery and traveling. Again SDR Touch is in early development and everything is not perfect, but we feel that at $9.99 that it may be very well worth the price to keep this program in development. Thanks Martin for a really cool piece of Android software! Interesting info. It appears it’s back in the Google Play Store…but unfortunately it appears that my Kindle Fire HD is not a “compatible device”. I hope there will be a workaround for that as I’d love to try one of my R820T’s in this manner. There would be a work around if Amazon would have it on their app store. Google play is playing around and wasting time with this good app. This is the same for my Cruz tablet which is not Google certified and many other tablets aren’t Google certified that would work great with this app. I tried the app, and yes, it’s a demo version, but I am interested in buying the full version and also have the USB driver included. Since it worked this got me wanting to buy a second RTL SDR for my tablet! Would be very interested if the SDR program worked with your CRUZ as I have one that would be great to use for SDR. Warning: some of the Chinese/eBay dongles work only on PC as they need higher supply voltage than available on mobiles. But the packages and dongles look identical! I bought several and only some of them work on my Galaxy Note II (blue LED doesn’t glow on others and they are not recognized by the application, but on PC they work OK)! You meant amperage perhaps? Usb voltage is 5V regardless of anything. I used n2aos.com to root my kindle fire hd 8.9 to Android Jellybean and am very happy with the result overall. However, I eventually found out that their Jellybean port has the Kindle USB port disabled for use with the OTB cables due to power limitations of the Kindle. Unfortunate as i had hoped to use the dongle with the Kindle Fire but no luck on that front. I have enjoyed monitoring the local 2 meter repeater nets with the dongle on my Win laptop. So, don’t run out and buy a Kindle Fire for the SDR. I’d be interested in that as well. Well I was able to sideload the demo version onto the Kindle Fire HD but then I couldn’t see any conceivable path to upgrading to the full version. Ultimately I wound up rooting the darned thing which was a bit of a project but ultimately successful when using the info starting at this link: http://forum.xda-developers.com/showthread.php?t=2069117 . This is one of those rare cases that I put the cart before the horse as I’m still waiting for my OTG cable. While playing around with the software I discovered something interesting when touching the menu icon. I found a setting for “Remote Connect”. When selected it shows “Open remote device” in a popup window and offers a field to type in a hostname and port number. Apparently this requires rtl_tcp. I ran it with one of my dongles from the command prompt but I was unable to connect to it remotely across my LAN. Maybe this is a future feature; I haven’t seen it mentioned anywhere yet or I flat out missed it. That would be another great option to have available. Very cool concept. Works perfect on my rooted Samsung Galaxy Note 2 with Jellybean and the RTL2832U. I purchased the $9.99 “Pro” version to help encourage / support Martin’s development efforts. Maybe someone can make this work with the APC. No luck for me yet. Received my OTG cables yesterday, but as I research this further it seems that more additions need to be made to my rooted Kindle Fire HD to make this work. I’ll work on them as I can but not sure that it would be worth it for a lot of people to go through the “hassle” to get to this point. That said regardless of the outcome I paid my $10; it’s great to see developments of this type on these small platforms. If I can get mine to work I’ll be back with some sort of step by step. If your device has only Otg power issues (if you connect the dongle to a powered hub it works) then you only need to buy a “usb emergency charger” (the ones u lsing common batteries like aa or aaa retail for 5 bucks) and then splice the hub’s power cable to turn it in a battery-powered hub. As long as the voltage is the same and you respect the polarity everything will be fine. The hub will make sure that you are not recharging the tablet or overloading it somehow. I think I did see commercial products that save you the soldering, but I’m pretty sure that they are horribly overpriced. I for one am looking forward to what you find out. As far as costs and effort go, I have yet to find a receiver that will tune from DC To 1.4Ghz or better using 2 small pc boards and a small laptop. Now all we need to do is port the software to a tablet for even more portability. I can’t wait to have someone look over my shoulder as I tell them I am monitoring international space station traffic! SDR Touch has been once again removed from Google Play. This is because SDR#’s developer issued a fake complain against SDR Touch in order to take it down. Google is legally required to keep SDR Touch offline for no more than 14 days, so we are expecting to have SDR Touch back in 14 days! He has done this “infringement” BS statement on many of the SDR radio groups, many radio user members are ditching their PC for Android phones and “Tablets” as well as the Raspberry PI. Some Android phones have FM receivers that need to be activated and it is my understanding that his “algorithm” is involved with that apk. .
BTW at $10 it may be a bit “pricy” for some. You need to get in touch with Amazon.com app store and post it there since many SDR dongles are being sold on Ebay and you should offer it available as a link at Noo Elec’s site to download it. Also how much will it cost? Because I need it. I might as well buy another SDR dongle not just for the netbook, but for the Cruz tablet as well. hope I can buy it soon! when it comes with iPhone? Hi Martin tried your app from google play and your web same results….Galaxy Nexus is recognized by your software but crashes ??? This is the main reason why I need to get a new tablet and use my SDR with it. Likely I can take it outside for better reception using a better antenna or use it in the car. You need to make this available at the Amazon.com app store instead of just posting it on Google Play. Many people would appreciate using this app in the comfort of their own home when away from the PC. And this would make perfect since the RTL SDR’s are being sold on Amazon.com. Ok, Here are my observations. I tried to get it working on my Cruz tablet “without Google Play” by downloading the file from here in the browser. The app installed correctly, BUT! the tablet needed a USB RTL 2832 driver for it work, BUT! the driver has to be installed from the Google Play store. Then I tried to install the app on my phone, same again it needed the USB driver via google play, it installed, but the bad news is that the phone needed rooting, which I cannot do. So I am stuck between a rock and hard place because I cannot get a RTL 2832 driver outside the google play store and probably need to root my tablet! After soldered pin4 & 5 for making an USB OTG cable, i use every day my phone (SAMSUNG Note 4.0.4)and the CINERGY Tstick RC. I have, with these two elements, a very goof receiver that i use for aeronautical. Perhaps a development for boats (AIS) will be a good thing. Also a receiver with memory presets will be good. Just downloaded the Pro Key and my Samsung Galaxy Note 2 with the OTG cable and a Hong-Kong EBay RTL dongle has turned into an amazingly well working receiver! As I am traveling now and do not have access to any antenna other than the one provided with a dongle, I can’t fully judge the performances, but the first trial was very impressive. The Up-converter is waiting for me at home and am eager to try it as soon as I return. Thanks Martin! This is a great little tool and easy to use. Working on my Acer Iconiatas with Android version 4.0.3. Value for money and will be great if it can be evolved more. I am great full that those with the ability are able to share with us that have non. Thank you Martin I hope its sells well. SDR Touch is awesome. Working on my Samsung Galaxy S4. I think I am going to invest in a usb hub cause the S4 uses the same usb micro usb port I have my adapter cable with a dongle plugged in to for power so a fully charged battery is a must for sustained listening. Will be purchasing the key soon…the free version passed my test for sure !! Thanks for developing this. I can also confirm that my close friend has it working on his S4 also and he paid for his key already. I just purchased the key. I really am enjoying this little app on my Galaxy S4. I hope more people will purchase the key to help further the development of this app. It is great to see an initiative like this that exploits the computing power of handheld devices. I did something similar to this 2 years ago on a second gen Droid running Android 2.3; basically a port of GNU Radio plus my own custom sdr hardware supporting both transmit and receive. I may revisit my project this winter now that a higher perf wifi module is available. Samsung Galaxy 4 mini doesn’t work !!! 🙁 dammit. anyone knows how to fix this problem? S4 yes, S4 mini nope!! why?? This is the 2nd dongle I tried, same type. I get get “no devices found”. The driver shows to be installed OK. Please help. I have the same problem as Don with my Galaxy Tab 2 10.1. The tablet can see a USB memory stick with the OTG cable, but when I tried the R820T thru a hub I got the same messages “no device found”. Works beautifully with my Lenovo tablet. It has astonished people at the ham club meeting. I purchased the key to unlock all the features.